On July 27, US Treasury Secretary Steven Mnuchin (Jew) imposed new sanctions against thirteen former and current Venezuelan officials including the interior minister Admiral Carmen Melendez, senior military brass, the president of the electoral council, and the finance chief of state oil company PDVSA, whose US assets would be frozen. “Anyone elected to the national constituent assembly should know that their role in undermining democratic processes and institutions in Venezuela could expose them to potential US sanctions,” said Mnuchin. The opposition and US moves are to force Maduro to give up his plan to have a 545-member Constituent Assembly elected on July 30. 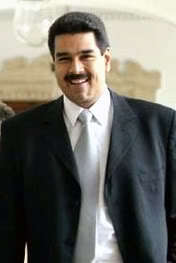 Maduro called the US punishment illegal, insolent and unprecedented. “Who do these imperialists in the United States think they are? The government of the world?” he said in a speech. The opposition has rejected Maduro’s proposal of holding round table peace talks ahead of the National Constituent Assembly vote on July 30. The pathetic anti-government liar from Miami, J.J. Rendpon bemoaned recently that the opposition is losing its support as the protesting crowds are shrinking. Last month, an anti-Maduro terrorist hijacked a police helicopter and attacked country’s Supreme Court building in Caracas. As usual, the Jewish-controlled media is busy churning Fake News in order to demonize democratically elected Maduro government. United States have a long history of funding Western NGOs to bring regime changes in countries whose leaders refuse to take orders from them. Currently, this game is repeated in Venezuela, Cuba, Syria, Lebanon and Iran. In January 2009, Maduro political mentor, president Hugo Chavez order the expulsion of Israeli ambassador in Caracas along with entire Jewish staff in solidarity with Gaza people. Netanyahu blamed Iranian president Ahmadinejad for Chavez action. Both Maduro and Hassan Rouhani exchanged state visits last year. Watch a clip from Empire File below to learn the truth behind the Judea War on Venezuela.